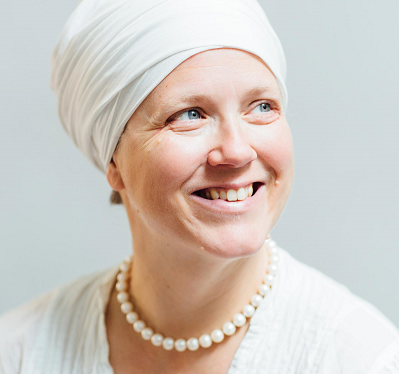 A KRI Certified Level Three Kundalini Yoga Teacher as well as Lead Trainer in the Aquarian Trainer Academy, Sat Purkh is known for her work in Sound & Mantra as well as Humanology and the Women’s Teachings; in 2008 she authored Everyday Grace: The Art of Being a Woman, an introduction to the Women’s Teachings of Yogi Bhajan. She has eight albums of sacred music, Nectar of the Name, Beautiful Day: The Aquarian Sadhana, Queen Be: The Goddess Within, Love & Other Miracles, Another Beautiful Day: Live Aquarian Sadhana, One: Love, Life, Light, The Pearl: Maiden, Mother, Crone, The Guru Within, and Across the World Ocean. She lives with her husband and their menagerie of animals, and is always at work on her next album of sacred music. See www.truebeingbeingtrue.com to learn more.